A recent spate in theft of cash from ATMs and vans that deliver the money to the kiosks has prompted companies that ferry the funds and are liable for them to seek insurance. Managed service providers and cash replacement agencies are both being covered, claim insurance providers. Alliance Insurance Brokers holds a major share in the cash management coverage business. The insurance brokerage had experience of settling claims in Jammu and Kashmir and Visakhapatnam in Andhra Pradesh during natural catastrophes earlier this year. Non-life insurance companies provide coverage against theft and other contingencies to companies that manage cash and ATM machine functioning. 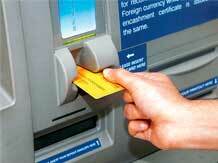 Banks also take cover for ATM machines against theft or damage due to natural disasters and other causes. For instance, several such machines were damaged during the floods in Jammu and Kashmir and Cyclone Hudhud that hit Visakapatnam. At present, public sector non-life insurers are active players in this segment, while private players also offer covers for specialised needs. These covers are customised as per individual needs and may cover cash in transit and personnel who are carrying the cover. A senior official of a state-owned general insurer explained that earlier, several smaller agencies dealing with cash replacement and allied services for ATMs were callous with respect to insurance covers. “These agencies are liable to pay 100 per cent costs (cash lost and life lost, if any) if there is any untoward incident. With the number of ATMs and robbery instances on the rise, even the smaller agencies have become aware of and are taking appropriate cover,” he added. There are also instances where the employees of a particular bank or cash replacement agency have been hand-in-glove with criminals to perpetrate a robbery. In such cases, the company concerned has to take a Fidelity Guarantee Insurance policy which covers the employer in respect of any direct financial loss which he may suffer as a result of employees’ dishonesty. Insurance companies also appoint surveyors to assess the amount of loss and to ascertain if it is a genuine claim. Based on the size of the claim, settlement can take anywhere between a few days to two or three months. As of June this year, there were 1,66,894 ATMs in India according to Reserve Bank of India data. This includes 87,543 on-site and 79,351 off-site ATMs.